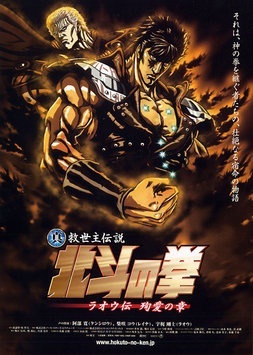 Shin Kyuoseishu Densetsu Hokuto no Ken (Legends of the True Savior Fist of the North Star) are a series of movies which were released between 2006 and 2008 to celebrate the 25th anniversary of the franchise, which originally started in 1983. The movies are a re-telling of the original series, with some new stories and characters added in, and all new animation done by TMS Entertainment. New voice actors were used for returning characters, such as Hiroshi Abe voicing Kenshiro and Yuriko Ishida voicing Yuria. As of 2011, none of the films in the series have ever been released in America, although fan subbed versions are available. The two Legend of Raoh films and the Kenshiro film were also given cinematic releases, whilst the Yuria and Toki films were straight to DVD.